I had to be in the city centre today, on business. For various reasons the bike was impractical (it takes a peculiar set of circumstances to render a bike impractical as far as I’m concerned, I can assure you) and so I took the bus to Princes Street and did a lot of walking. I think I’d covered several miles by the end of the day, as the still-controversial tram works have messed up the bus routes and I spent ages wandering around trying to find a bus stop that would allow me to get home again*. It was brutally hot — at least as far as I am concerned — and I was dressed for work and on a schedule. The streets were furred with the inevitable tourists. At this time of year there are lots of tourists, and it will only get worse as we move further into Festival season. It reminds me of fat-clogged arteries: there is only so much space on the pavement, and when there are lots of people standing there gawping at the architecture, taking pictures of each other next to the Scott Monument, waiting to get on a tour bus, or trying to decipher street signs and the complexities of our public transport system there isn’t enough room for those of us who are trying to get somewhere in a hurry. I dislike very warm weather unless I’m in the sea, spoffling sea creatures, and my temper was fraying after I’d walked the entire length of Princes Street three times and been up and down Cowgate, Lothian Road and George Street. My feet hurt — that’s the furthest I’ve walked since I injured my plantar fascia — and I was hot and bothered and grumpy. I decided to take a breather before I melted into an angry puddle and went to find some soft grass in Princes Street Gardens. There’s a children’s playpark at the west end. It has the usual slides and some interesting climbing structures, but what caught my eye was the Victorian Merry-Go-Round. I find funfairs creepy at the best of times. The scents, sights and sounds of the carnival don’t inspire me to think of excitement and the thrill of wurlitzers. There’s something scarily superficial about funfairs. Perhaps it’s their itinerant, temporary nature, or the way the high gloss, gaudy colours, candyfloss aroma and loud, brassy music never quite cover up the cables and motors, the stale grease and spilled beer and the racing thud-thud-thud of the generators. They are the buzz of a brain fried on sugar and caffeine and adrenaline, hiding behind a painted mask polished to a high sheen. I’ve never trusted them. They are shiny and they smell bad. The attendants always look bored. They give me the same sense of disquiet as some adverts do: the explicit message is at odds with the implicit. 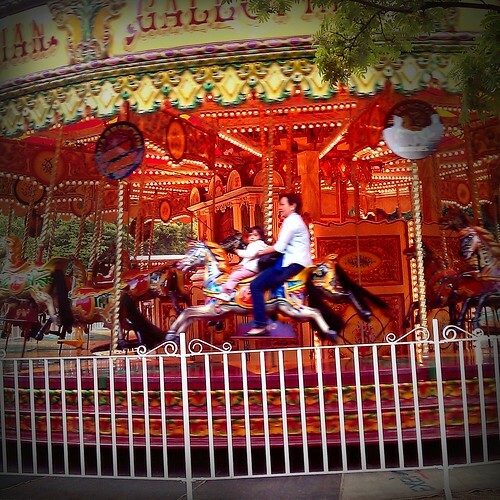 I took this picture of the Victorian Merry-Go-Round. I didn’t mean to include the only people riding it at the time. They arrived in the middle of the shot as the shutter snapped. I like this image, however. The small child, face blurred beyond recognition as he or she looks towards the camera, expression unreadable but certainly not one of thrilled delight. The way the movement of the horses makes their outlines and painted decorations blur as if at any moment they could disperse, perhaps to reform as something else; perhaps to dematerialise, taking the riders with them. In the centre the hub is still and sharp: here is the only safe place on the Merry-Go-Round, where the attendant sits. What does he know, to sit in there while everyone else rides the glimmering ponies? The colours are hot and unnatural. The fence looks to have been added later, an afterthought to disguise the ephemeral character of the ride and make it look less like it will fly away at any moment, should the attendant choose to press a particular button. On occasion I’ve thought I’ve caught something in the expressions of funfair attendants that was slightly too sharp, too predatory to be pure boredom and I’ve wondered, as I do so often, how to peel back the superficial layer to see what is really going on underneath. And then I remember that I live on Planet Sam, where the creepy polar bear isn’t there simply to offer helpful advice on frozen food but is on an infiltration mission, and nicotine patches cause you to hallucinate giant cigarettes. I am the sole inhabitant of Planet Sam (although Frood has a permanent visitor’s pass), which is probably for the best. *As it was I got on the wrong bus and had to get off at a stop a couple of miles from home because I thought I might end up in Portobello by mistake and have to walk even further. Now I have blisters and possibly have taken too much sun. Need to check whether my poke at the tram decision has had any effect. AFAIK the tram ‘route’ up Leith Walk is generally complete in respect of the road layout (but not the steel and sparky bits) this means that we could run ‘trams’ it they were more like buses (with rubber tyres and engines). Now it just turns out that doing it this way costs about 10% of the price you pay for having rails and since you don’t need to put all the rails in place before you can run the service you could actually start running a version of the Edinburgh ‘tram’ pretty quickly with what is now in place – and it just so happens that someone has built a few of the right sort of buses to do this as well. http://vimeo.com/12499536 Curitiba’s BRT : Inspired Bus Rapid Transit Around the World. ~a point or region of infinite mass density at which space and time are infinitely distorted by gravitational forces and which is held to be the final state of matter falling into a black hole. Taking a break from tri this year because we're sorting out our new old house. Otherwise I'd never get any writing done. Theoretically, Aberdeen Assault II is still on, but I'll have to see how my medial collateral ligament is faring. New House Journal. Day 9. New House Journal. Day 5. Kayucian on New House Journal. Day 9. House Moving Journal. Day 5 Someone's Imaginary Friend on New House Journal. Day 5.